I don't know about you but I think Gareth Edwards and the rest of the Star Wars: Rogue One team are very smart. That's because with the first Rogue One trailer they very much made the movie its own. Yes, it's set in the Star Wars universe, but the trailer made it clear this is a story we didn't know. The second (or third, depending on how you look at it) trailer landed today and while it's still all about Rogue One, this time it reminded us that we're still dealing with Star Wars. Along with an appearance by a certain heavy-breathing man in black, there were lots of little nods and references to Star Wars so subtle you might have missed them. Below are all the ones I could find - some obvious, some speculation - but let me know if there's anything I've missed. There was something about the moment Mads Mikkelsen's Galen Erso walked away from his home and young daughter to meet Krennic that really made me think of the original Star Wars movie, but it wasn't until Reddit user indiceiris pointed it out, that I realised why. This landscape shot is so similar to the one of Luke Skywalker on Tatooine - even the equipment in the shot is similar. It's such a smart but subtle way to hark back to the original you barely even notice it. 2. Have you seen this droid? No Star Wars movie is completely with a loveable/annoying droid, and although Rogue One will be introducing it's own robot sidekick in the form of Alan Tudyk’s K-2SO, it hasn't forgotten about all the others out there. The eagle-eyed among you will have spotted the RA-7 protocol droid at about 0.31 in the trailer. Last time we saw one of these droids it was 3B6-RA-7 (aka Threebee) aboard a Jawa sandcrawler in A New Hope. Interestingly, this droid line was originally designed as a spy droids so maybe Jyn should watch out for this one. 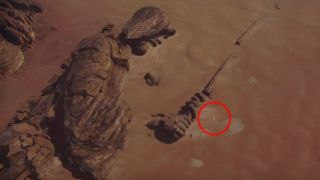 I'm going to hold my hands up and say there's no way I would have spotted this Knights of the Old Republic reference no matter how many times I watched the trailer. Thankfully, there's better Star Wars fans than I out there and Reddit user sombraptor spotted this Hammerhead Cruiser from the video game Knights of the Old Republic during the space battle. Like they say: "Never thought I'd see the day where something originating in KOTOR would end up in the movies..."
This is one of the more obvious throwbacks to the original trilogy, but it's one of my favourites because it looks amazing. At 1.13 in the trailer we get a shot of the Rogue One ship going into lightspeed and the shot is so reminisce of the one with Han Solo and Chewie on the Millennium Falcon, I teared up a bit. Enough said. This is a pretty cool shot from the trailer. It was only on screen for a few second but it's fairly obvious that this is Jedha, the Jedis' holy land. The ruins here aren't the only thing that's interesting about the image though, because there's also a really small transport moving in the picture. I've seen some suggests that it's something similar to a pod racer and at 1m05s you can see this which definitely looks like a podracer engine. It's not just the old Star Wars movies the Rogue One trailer is channelling, as Reddit user Quite_Operational spotted this Star Wars 7 nod. The 4-winged Imperial shuttles that make an appearance in the trailer seem to be some sort of predecessor to Kylo Ren's shuttle, which we saw touch down at the beginning of The Force Awakens. Obviously, timeline-wise, there's a huge gap between the two movies, but Kylo Ren is a Darth Vader groupie. Maybe he found an old 4-winged shuttle from back in the day and decided to do it up.